Many Americans – and people around the globe – experienced the 1960s, ‘70s, and ‘80s as an age of political uncertainty and social turmoil. It was a powerful time: everywhere the specter of disaster loomed, yet that fear brought with it a unique capacity for change enabled by commonplace desperation. In the United States alone, mounting resistance to the Vietnam War built confidence among grass-roots activist organizations for their efficacy in up-ending the status quo. And while mutually assured destruction terrified the world, the threat of nuclear war also inspired many thinkers and activists to strive for equally bold solutions. In the light of world chaos and potential mass destruction, the idea of building a global government and abolishing nationalism seemed especially promising – far more promising than what the United Nations seemed ultimately able to provide. It’s no surprise, then, to see a large proliferation in world peace literature in the Cold War era. Some publications were mild and innocuous, but many took the form of bold declarations and manifestos about the urgent need for radical change. An excellent example of the latter is One World: The Approach to Permanent Peace on Earth and the General Happiness of Mankind by John Kiang. Self-described as “a manifesto of revolution for world union with the evolutionary law of group expansion as a guiding theory,” it examines shifting technologies and living conditions to build a larger argument in favor of a unified humanity. From that perspective, nations and nation-states can only be seen as counter-productive: the deep-seated but fundamentally arbitrary veil of nationalism impedes sincere appeals to common humanity and mutual accountability. In this work we see the role that cultural context can play in international movements: though not explicitly outlined, One Worldcontains thematic and rhetorical ties to the utopic vision of “Great Unity” in China. Great Unity represents the goal of creating a Chinese society of mutual accountability and selflessness – a cohesive community where people work to help others rather than harm them. First described in classic Chinese texts going back millennia, Great Unity was popularized by Sun Yat-Sen in the early 20th century. In doing so, it was used to help build a cultural momentum in favor of a shift towards a communist ideal. The Great Unity message was adopted overtly in China’s national anthem in 1937; though later supplanted with another song in the People’s Republic of China during the Chinese Civil War, it remains in use by Taiwan to this day. John Kiang left China in 1949 in the wake of the earth-shattering Chinese Civil War. It seems fair to suggest that he nevertheless brought the culturally-specific vision of world peace, prosperity, and harmony with him stateside. It’s hard for those of us living in our countries of birth to imagine the inner turmoil he must have felt during that time, working for global peace a world away while his homeland was experiencing such complete upheaval and division. Perhaps that effort helped him, in some way, to bring his home with him and improve the world as a result. These efforts manifested in One World. 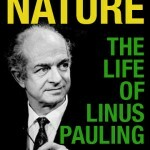 Though a relatively obscure book, One World at last found some degree of traction once it found its way into the hands of two-time Nobel Laureate Linus Pauling – surprisingly, Pauling was willing to attach his name to it in the form of a guest introduction. As a famous peace activist, Pauling was a prime recipient of unsolicited manuscripts, book ideas, calls for action, and reference requests. But of all of the texts he received and was asked to endorse, why would he choose one such as this? Even when meticulously compiled and researched, correspondence collections can still resist post hoc scrutiny. We hold a substantial set of letters between the two activists, but we lack the connection point between the “before” and “after” of when Pauling agreed to add his name to Kiang’s One World project. Was it a letter that went missing? A phone call? An in-person visit? Kiang later sent Pauling a photo of a meeting between them, but the context for how and when it happened is largely absent. On a general level, One World embodies the slippery way that ideas persist, spread, and evolve. Just like how John Kiang built his own vision upon seeds planted by Sun Yat-Sen and many authors before him, it will be fascinating to witness how the Cold War push towards internationally-regulated peace and world government will rear its head again on the world stage in the decades to come.